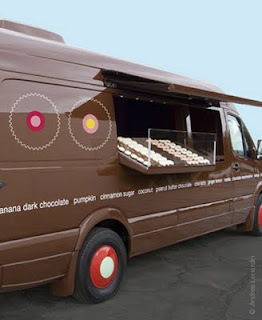 La vie Jaime : Cupcakes on wheels- an appropriate lunchtime post! Cupcakes on wheels- an appropriate lunchtime post! How amazing is this- a cupcake mobile! For a minimum of $2,000 you can have your very own SPRINKLESMOBILE at your next party. There are tons of cupcakes to choose from, and they all, as a huge cupcake lover, sound delish! My faves range from Banana, Red Velvet, Dark Chocolate, and Peanut Butter Chip. Check out the website; what's your favorite cupcake? Darn it! Where was this thing while we were taking pictures with the photographer at my wedding! For that matter... where was this mobile yesterday when I was starving at work?? ;) Yum! How fabulous! Red Velvet or vanilla are my fave cuppycakes! I love all of their flavors! OMG how cool. i want one! WOW! This is deliciously awesome, I confess cup cakes in any and every flavor are my fave !! !